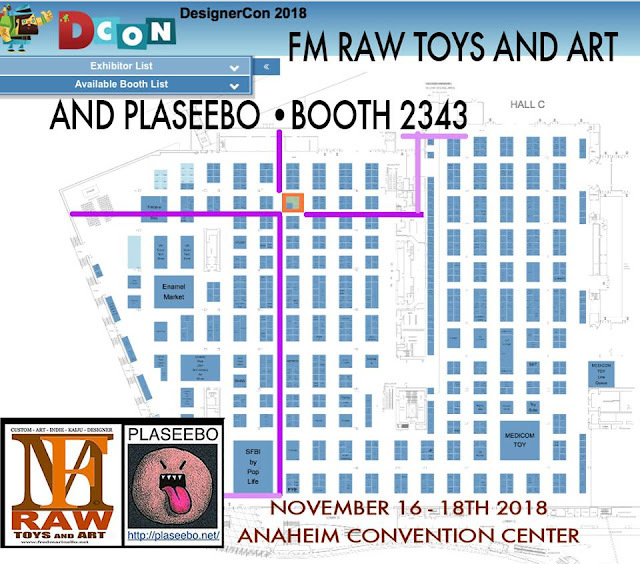 Plaseebo announces that they'll be attending & boothing at the coming DesignerCon 2018 (Nov 16-18), showing with RAW TOYS at Booth # 2343. Featured below is a sampling of what they'll be offering up at the booth, so do hit them up, say HI to Bob Conge, buy some awesome "American Kaiju" - this'll be his first time vending at DCON too! 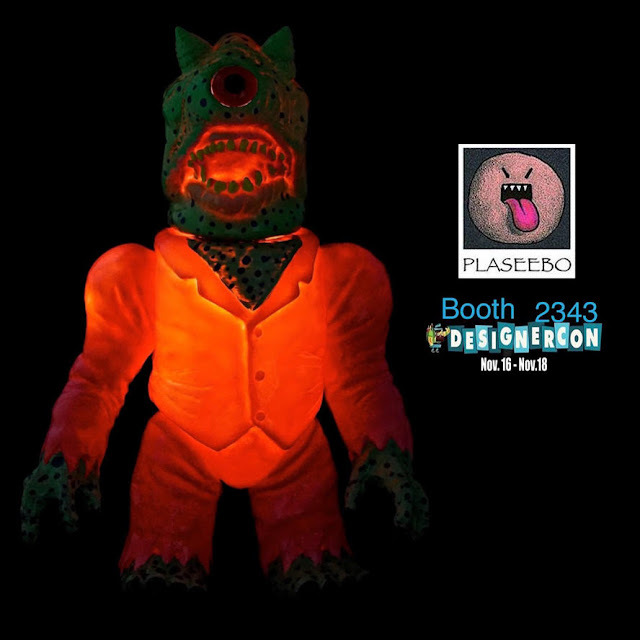 Stay connected to Plaseebo's Instagram and Twitter for further reveals and updates, leading to D-Day! 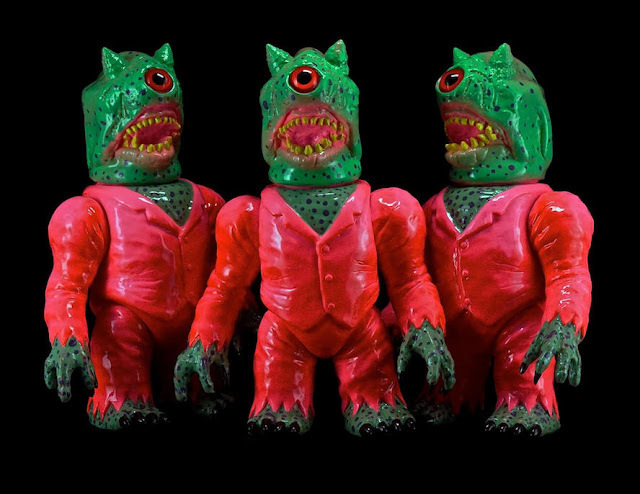 PREVIEWED: “The Pox Cyclops” Exclusive edition of 3. 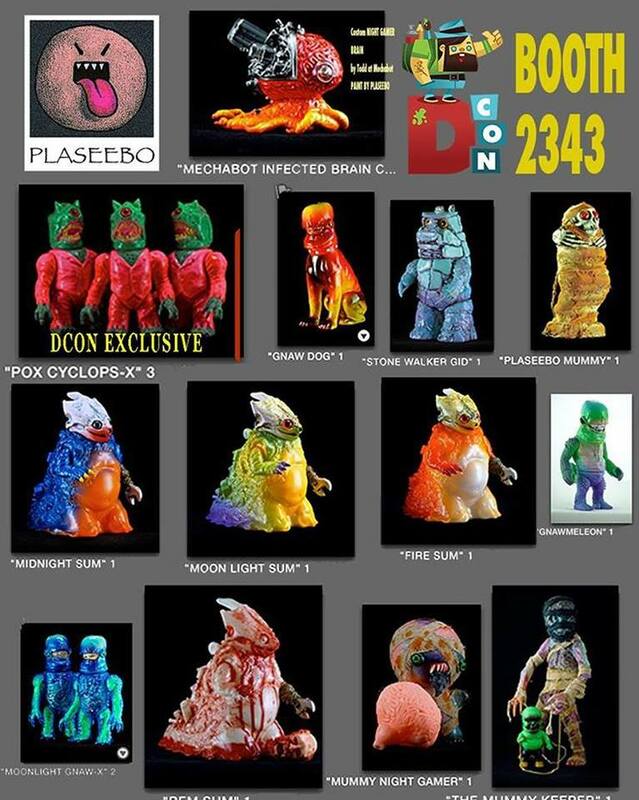 Plaseebo /SHB/Rampage Toys. 8 1/2” Vinyl with red glass inset eye and an internal motion activated color-changing LED unit with replaceable batteries. Painted and signed by Bob. Below image features LED unit on in darkened room. PREVIEWED: “The Mummy Keeper” is a Plaseebo custom mash-up of a PLT Blood Majin and a Violence Toy figure. 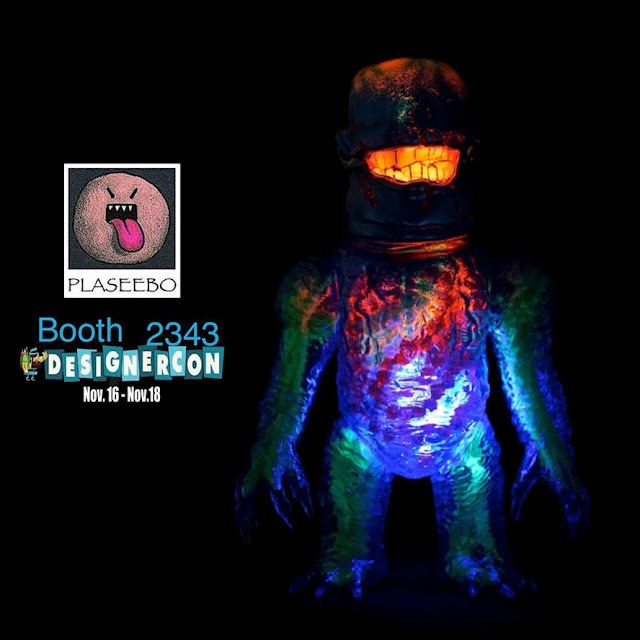 Each figure has an internal motion activated color-changing LED unit with replaceable batteries. Mummy figure has red inset eyes and is wrapped in Mummy cloth. Painted and signed by Bob. Above-right image features LED unit on in darkened room. PREVIEWED: “The Moonlight Gnaw” Exclusive edition of 2. Plaseebo /SHB/Rampage Toys. 8 1/2” Vinyl with green inset eyes and an internal motion activated color-changing LED unit with replaceable batteries. Clear blue vinyl body filled with monster guts. Painted and signed by Bob. Below image features LED unit on in darkened room.